Drew Kinchen: Where did you go to grammar school? Did you stay on the island? Jack Kinchen: I was schooled in France. I played soccer over there, yeah. Annette Kinchen: Yeah, he was good at soccer. Jack: I was schooled in England also; I had never seen the game of cricket before. They put me on a team and I don’t know how, but I made it to varsity! [Laughs] Cricket! Pow! But soccer, oh yeah, that was my game. Nobody could take the place of me, my baby, oh no. I would have played soccer twenty-four hours a day. Drew: I always heard you were very good. Jack: Oh yeah, I was drafted. [for the French national team], but ehh, the war came up. If it hadn’t been the war, I would have stayed in France and played soccer. I would have become a doctor. The war, the war. History decided other [things] for me. Drew: What about your story, Meme? Annette: We were on the same island. We met at a surprise party. We got together, got married, and decided to come here in America. And I was very scared, because I never travelled. Drew: After you were born on the island you never left until you came to America? Annette: Uh-huh. But I was curious; I came over here and was very scared. I couldn’t speak the language and I had to adapt. And it was very difficult. Jack: America was a big country, but I was used to a big country. I was in France, France isn’t that big but..
Drew: But you had been all across Europe. Jack: Oh yeah, so I was drawn. Matter of fact, I wanted my father to let me go to America sooner, but he wouldn’t let me. He had three sons. One was killed and one was a prisoner of war, so he said please stay with me. I stayed with him. A year after he died, exactly, I came here. You know how difficult it was for me? Me!? Jack Bunel. To come and get a permit to come to this country, we had connections with Ford, with Pan-American and it still took me a year to get in. Now is not the same. 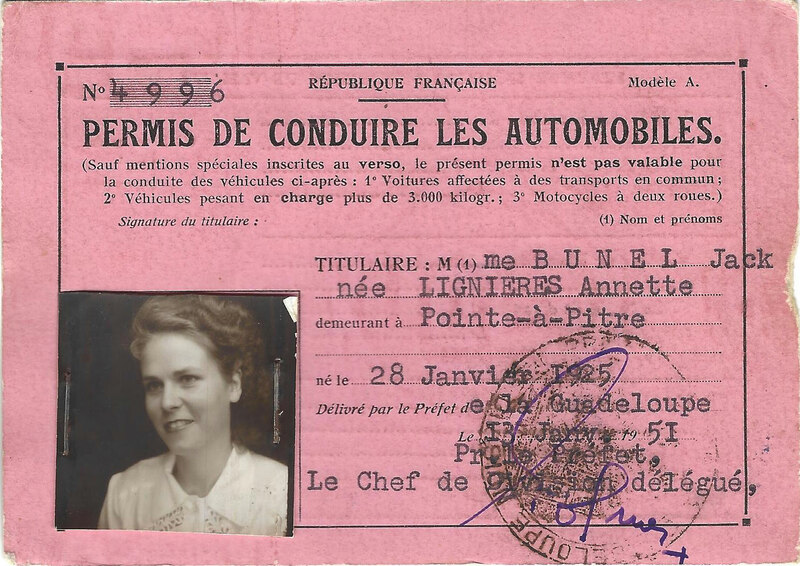 Annette’s Guadeloupean driver’s license from 1951.